In an ideal world, when we ran into a printer error we would hit the “Easy” button and everything would be fixed. Luckily, issues with 3D printers tend to be on the rare side. But on those occasions when you do get an error, you don’t need an Easy button. You just need the troubleshooting tips below! 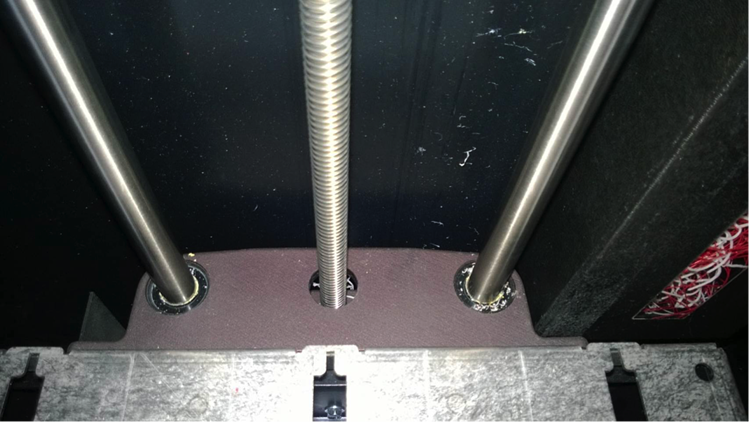 The most common problem users run into during the printing process is loss of extrusion. This occurs when one or both of the materials don’t come out of the nozzle when they were designed to. In the back of each machine user guide, you can find instructions on how to fix the problem and get the material flowing again. If you misplaced your instructions, you can view our step-by-step guide to fixing all your loss extrusion issues. Step 1: Select Continue from the control pane and shut off the power switch on the front or side of the printer (not the breaker on the back). Step 2: Once the printer is powered down, open the door and turn the lead screw at the center of the back of the build chamber to lower the Z stage. Step 3: Sweep off the rear of the stage around the lead screw and guide rods. Once you have removed everything (usually a piece of material that broke off from a failed build), turn the printer back on and test it. If it fails again, call TriMech Tech Support because there is an underlying hardware failure. A layer misalignment issue won’t display on the screen or stop your print from happening like the previous problems would. Instead, this is a complication that won’t be apparent until after the part is printed. After your design is finished, it will look like a layer in the middle has shifted and is not smooth, which is exactly what's going on! There are three things to check to make sure everything is realigned. Step 1: Check each of the belts. They need to be on the middle ground between too tight and too loose. When you pinch them together, you should feel a little but equal resistance. If you find that one of the belts feels tighter than the other, they need to be adjusted. Step 2: Check the top plate. All rods and attachments at the top of the printer need to be tight and aligned. If they’re not, make the necessary adjustments. Step 3: Check the Z-axis rod. Before you start dismantling your machine, first try and test with the software running a ‘Printrun’ to test the print head by moving it up and down. If a Z rod is bent, you should be able to see it. However, if it is bent and there is no way to fix it, you’ll have to replace it. For almost any other error code on the display, first, try to power cycle the printer. Step 1: When the error is on the display, press the Continue button. Step 2: Once the printer starts to reboot, turn off the power switch on the front or side of the printer. Step 3: After it shuts off you have two options: turn off the breaker on the back near the power cord or just unplug the printer for two minutes. Step 4: Plug the printer back in or turn the breaker on. Turn on the power switch and test the printer. If the error persists, send us a configuration file from Catalyst (Dimension) or Control Center (Fortus 250). To get this file, leave the printer on, open the Catalyst or Control Center > select Printer Services (Catalyst) or Services (Control Center) > tab then select Export Configuration. After you have saved this file, email it to Support@TriMech.com so we can start troubleshooting the problem. Want to learn more about your 3D printer? Browse our Stratasys training courses!